LOS Tacos is a fast-casual Mexican restaurant in Bergen, a sleepy city in Norway, with less than three lakh people. Sometime in April, the restaurant put out a cheeky message outside their joint. It read: a�?Mexican food so authentic, Donald Trump would build a wall around it.a�? Within a day, the sign was on everyonea��s wall. Another sampler: Stephen Oa��Neill, an art director at a London ad agency, created a photoshopped billboard as his entry for an internal award. It looked every inch like an Economist ad sans the logo. The headline was clever. It had the words a�?Donald Trumpa�� with the letters D, O, N, and T highlighted. Everyone saw it as a negative endorsement of Trump by the venerable Economist. Understandably, the fake ad was shared 36,000 times on Facebook! Leta��s move to Vilnius, Lithuania. Artist Mindaugas Bonanu created a street mural for Keule Ruke, a local barbeque joint. 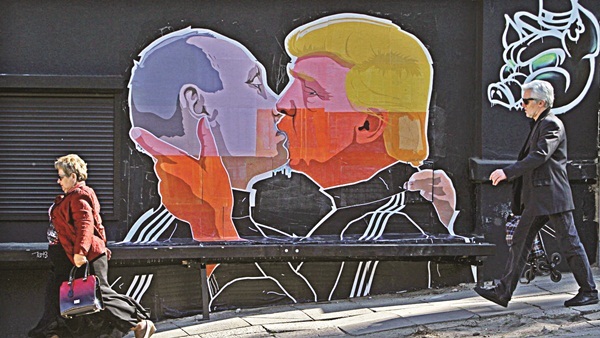 It was a graffiti-style painting featuring Putin and Trump in a lip lock. Almost every news site in the world has done a story around it. The one common factor in all these hugely share-worthy creations is Trump, the obnoxiously delusional megalomaniac who happens to be the Republican frontrunner in the US presidential race. He may be popular with the right wingers in his country but outside his borders, hea��s universally reviled for speaking like a petulant fifth grade brat. To figure out why anything anti-Trump goes viral, you have to understand that Trump is like Kejriwal. People just love to hate him. Anything he does gets their goat and sends their blood pressure soaring. So naturally, any piece that caricatures, spoofs, parodies or paints Kejriwal or Trump in a negative light provides immense glee to the audience. Whata��s at play here is visceral revulsion. Critics of Trump are simply amazed that an outrageous foul mouth could make it so far. Given the grim possibilities of a mercurial chump being handed the nuclear buttons, theya��d back anyone who could cut him down to size or strip him down to his a�?Emperora��s New Clothesa��. Ita��s like the blood-thirsty audience in a gladiatorial combat. People outside America (except Putin) will root for anyone who calls Trumpa��s bluff. Whether ita��s Jimmy Fallon, John Oliver or the three Afro-American kids who put out the F*** Donald Trump rap video, they dona��t care, as long as the braggart is stopped. Ergo, if you want eyeballs just add the T-word to your recipe.